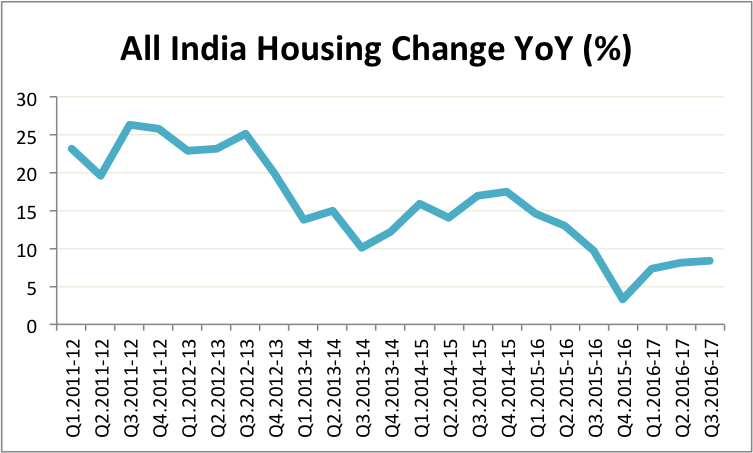 In Q3 2016-17, Indian real estate continued to show the sluggish growth that we have observed in previous quarters. Even though the actual change in price is still positive overall, the rate of change has been slowing over the years. 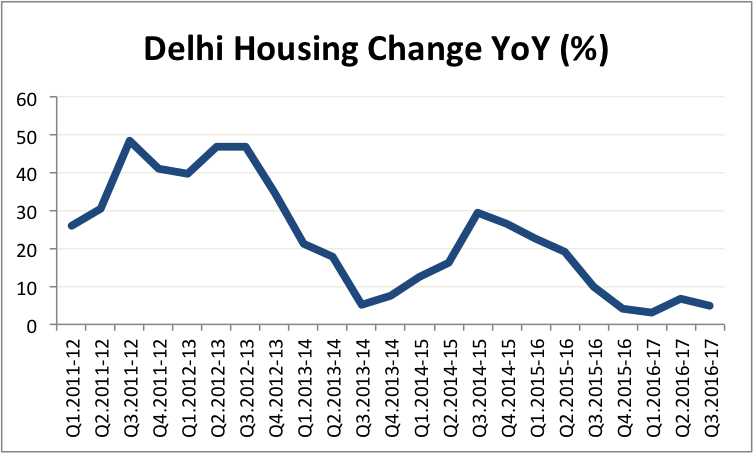 As explained in previous posts, it must be mentioned that the data does not capture the “black” component of real estate prices and may also be shifted upwards due to the fact that ready reckoner rates in cities continue to increase. 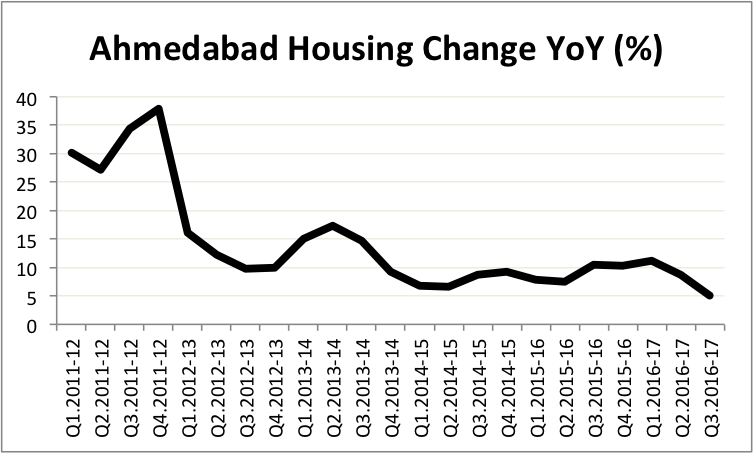 Keeping this in mind, the actual value of price change must be taken with a pinch of salt, but this exercise is useful in showing the trend in prices in the cities and across the country. 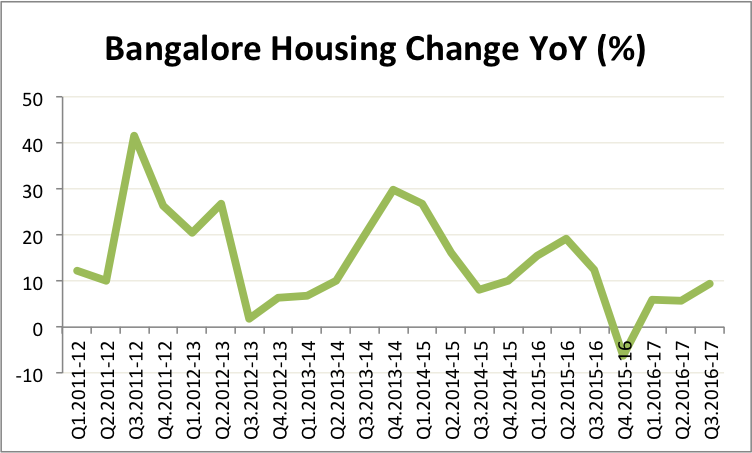 The major metros are starting to show a little bit of divergence when it comes to the change in real estate prices. 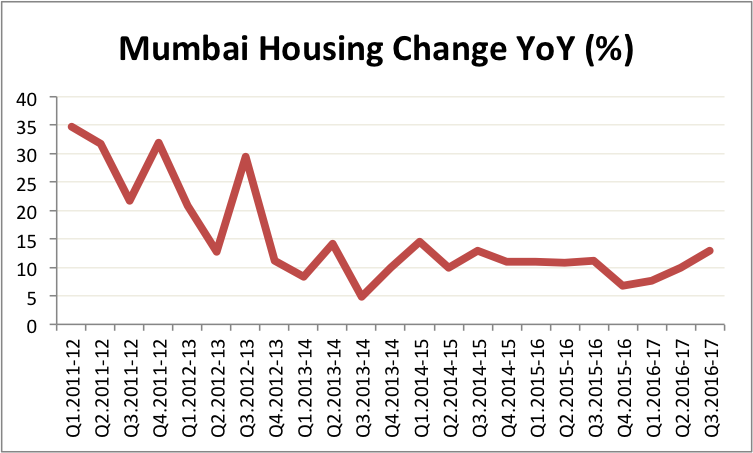 After many years of slow growth, the Mumbai markets are starting to bounce back. 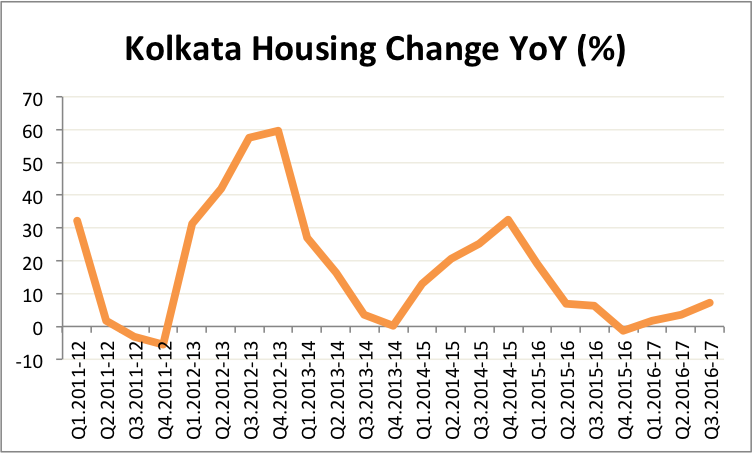 Similarly Bangalore and Kolkatta have seen a slight pick up over the last few quarters. 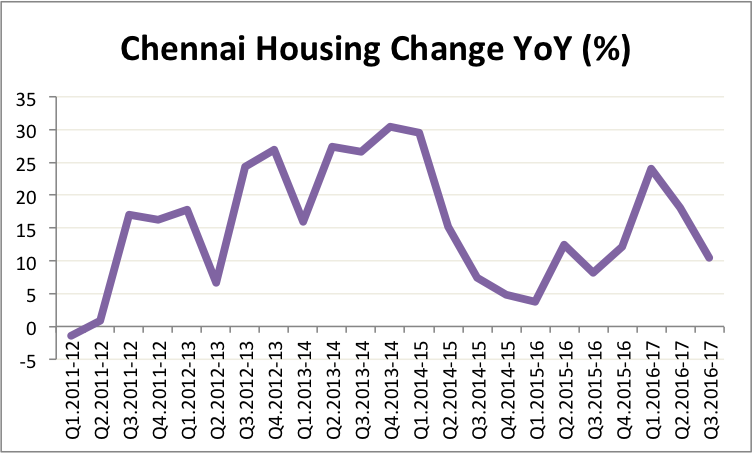 In contrast, Delhi, Ahmedabad and Chennai are still experiencing sluggish growth. The smaller cities though are still showing correction in prices across the board. 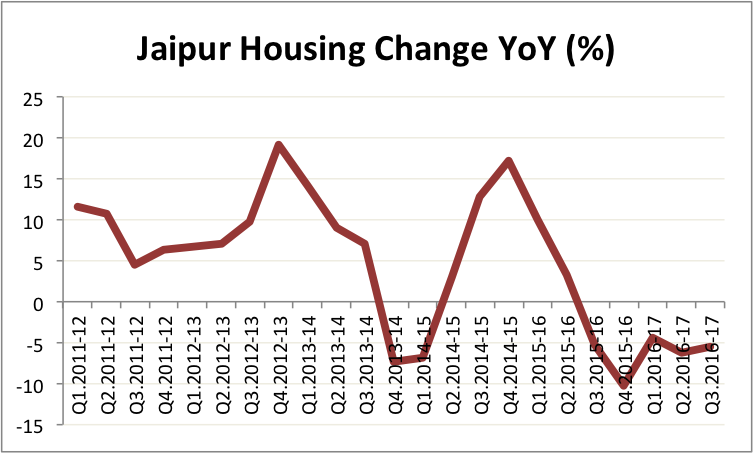 Jaipur is particularly acute, showing negative growth for a few quarters now. 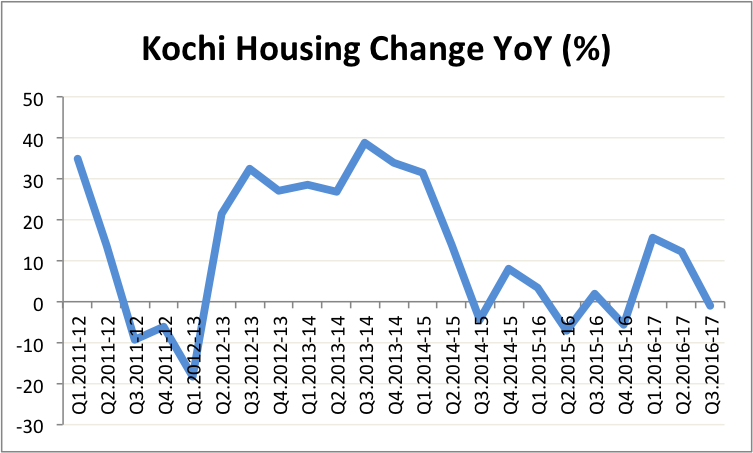 Kanpur and Kochi have also been correcting, possibly as a knock-on effect of demonetisation. 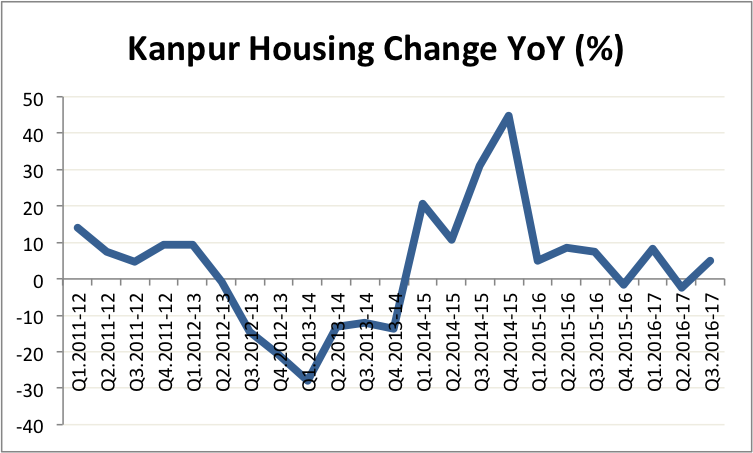 Lucknow on the other hand seems to be more stable. 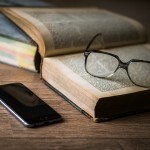 The real estate sector is going through a number of structural changes. 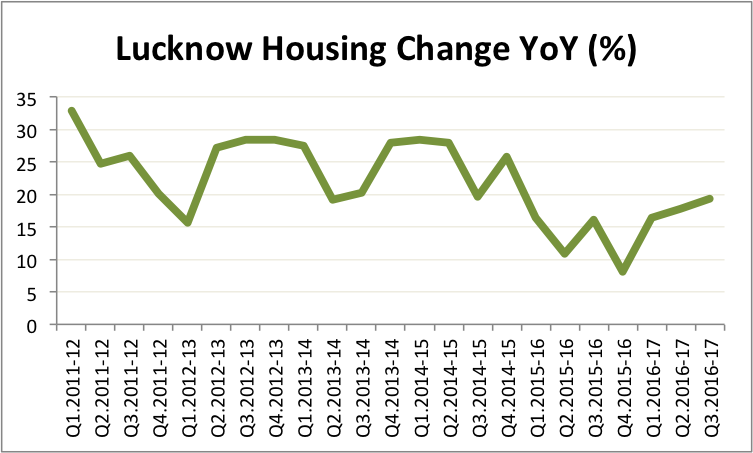 After the boom years, the industry has been consolidating for five years now. The government has also introduced a lot of new legislation such as RERA, GST and demonetisation, all with a view to clean up the sector. On the whole this is a very healthy correction and we will likely see a much more formal, transparent and efficient sector in the years to come.